What are your friends saying on their Facebook pages. Or Twitter? Is it funny? Is it weird? Is it what they ate for dinner? 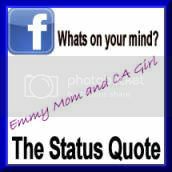 Well share it here on The Status Quote with CA Girl and Emmy! Simply post those funny, strange and daily posts of your friends. Please exclude names and locations. And then, link up! It looks like Halloween vomited across the street from our house, stupid rednecks. We just got slapped around in Columbia. Enjoyed my New Wine tonight. is grossed out that Henry is eating an apple to make his tooth come out. Seriously. Wait til your daddy gets home! is having issues this morning...hoping coffee will fix it. Oh man I am having so much fun reading all of these! Thanks so much for playing. I loved, "is mostly harmless" I have to remember that one.